Sometimes people think I am a “professional seamstress” or at least an experienced sewer. Yes-I have done a lot of sewing, but most of it is self taught and none of it is professional. So, I had never tried making a zippered pouch before this and was honestly a little nervous to try. Guess what?! This is the easiest thing to make and I LOVE how mine turned out! 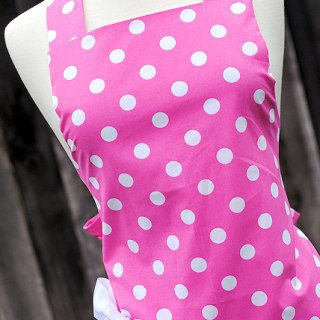 So much fun and a perfect project for our Learn to Sew Series for Kids. Really you could make it any size-it could be a coin purse, a makeup bag, whatever you want. Grab your zipper and lay it out in front of you. You are going to want to cut your fabric to the length of your zipper. So, if you have a 9 inch zipper, cut your fabric 9 inches long. My pencil bag is 9″ x 5.” So, cut 4 pieces of fabric that are the length of your zipper by 5 inches (or whatever size you want your bag to be). This will be 2 pieces of your main fabric and 2 pieces of your inner fabric. With your zipper laying in front of you, take 1 piece of your main fabric and 1 piece of your inner fabric and lay them on the zipper so that right sides are together and the zipper is sandwiched in the middle. In this picture the zipper is wedged in between the two layers of fabric and pinned along the top. 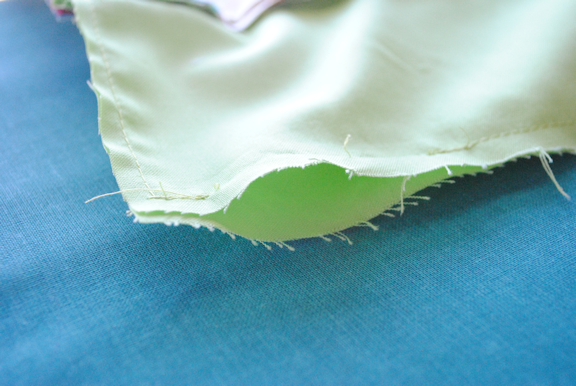 (Be careful if you are using directional fabric that you lay it so that it will be right side up when you finish. Sew a straight stitch along that. When you get to where your zipper pull is, stop sewing, back stitch and remove the fabric. 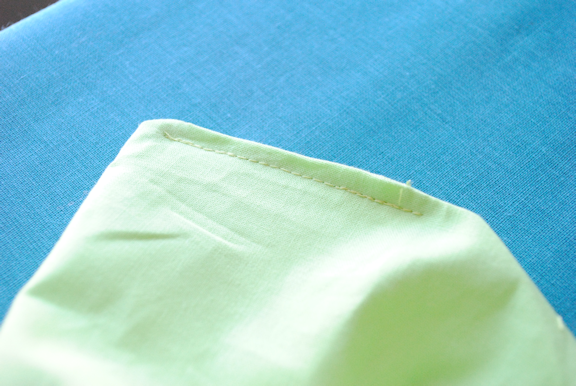 Move your zipper pull out of the way and then begin sewing again where you left off. Do this to both sides of the zipper. And you’ve got yourself a pencil case! cool. can’t wait to try this. I bought a zipper a while back to practice on something and this will be perfect! This is darling! And such a simple and practical project. Thanks for sharing! Do I need to have a zipper foot for my machine to do this? I only have the regular, clear one. (My machine was a hand me down and I’m still learning to use it). I didn’t use a zipper foot. Just move the zipper out of your way when you get to it. LOVE LOVE LOVE the fabric!! This was so helpful! I’ll definitely have to make this- after I get a zipper, that is. I love this! Unfortunately, I am not sewing machine-savvy, even though I have one. One day, though, I will do this! Pinning. Found you from the Pin It Party. is it necessary to have a zipper foot? Shhh, don’t tell anyone but I didn’t use a zipper foot. I never really do. Actually, on this particular way to sew a zipper you don’t even need it. Just move the zipper pull out of your way while you sew past it. This is a great simple project. If you have an artsy person that you need to make a quick gift for this is great, fill with some new markers or colored pencils/pens and give with a new pad of paper. Was also thinking to make it a little more special if you have an embroidery machine, you could put their name on it to make it more special. I just recently started doing zentangle and have pens that were getting lost in the shuffle. found this project and it works perfect. I am a quilter also so I had plenty of scrap fabrics around to work with. seriously if it took me 1/2 an hour I would be surprised. I did use a zipper foot so I didn’t have to worry about my sewing lines being straight by the zipper. If I wanted to put a thickish clear protective plastic over the front of the pencil case, would I just run it through with the zipper and fabrics all together? I think it would be best to just use that vinyl fabric stuff? Then it would be protected from the get go. Will have to remember this for when my kids start school. I am terrified of zippers, but I bite the bullet and move on! Zippers do generally scare me, however projects like this (I made this one for my son for school!) make it a bit easier. Zippers do not scare me, I’ve even replaced broken zippers in my jeans. It wasn’t easy but I did it! 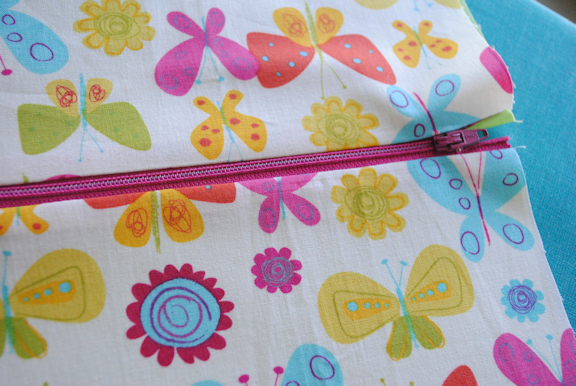 Zippers do not scare me anymore – they did when I first started sewing! Now, invisible zippers are my favorite kind of zipper to put in clothing. I’m not scared…actually made a pencil pouch last night! Zippers don’t scare me anymore! My twin daughters will love this for school! They’ll love it for home, too! I’m thinking of making a clutch out of this pattern. Just a shame I don’t need pencils when I go out! I absolutely Love all of your sewing tutorials! Zippers scare me for sure. I’m doing the monthly challenges with you and I have all the stuff to do the pin tuck pouch, but I haven’t started it for fear of the zipper. Depending on the project. A garment yes. Any closure makes me nervous. A bag or other project, not so much. This one is sort of like the zippered pouch we did for January’s challenge, isn’t it? I wouldn’t have tried this before because of the zipper, but now I know I can do it! I want to make this to hold my pens and stuff for my purse so they’re not all over the bottom! Yes, zippers scare me. I have yet to try a project with one. I love this zippered pouch! This was the second time I sewed in a zipper! My granddaughter will love this. I know exactly which material I want to make this out of. Making these next year when kids are in school!! They scare me a little, but I’ve started doing better at putting them in lately. 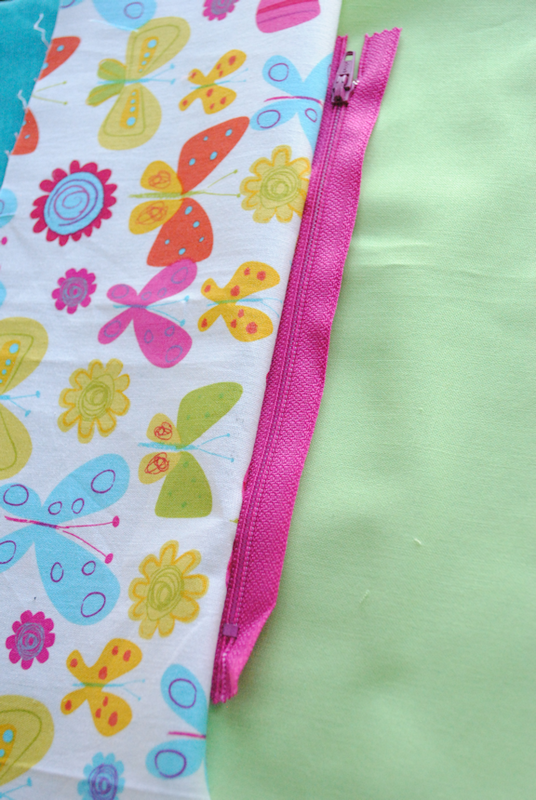 This project makes sewing in a zipper so easy! gotta try it. Super addicted to making these. Zippers scare me a little, but I sewed a pouch with one last month. Trying the zipper out gave me the confidence to try zippers some more! I am excited to create some things with zippers! Zippers did, until we did the pintuck pouch and now I feel way more confident! I really need to make this so when my surprise little boy starts school I can make some cute ones for him. Hmmm…I’ve never used zippers, so I’m not sure if I should be scared or not! They do scare me but you make it look easy! Don’t scare me anymore, all thanks to your Learn To Sew skirt tutorial! I’ve made zippered sleep-sacks for babies all b/c of you! Thank you! Zips don’t scare me – too much! We need some of these. I think I may add an extension on the bottom with three large grommets so it can be put in a 3-ring binder like the store-bought type. I love this one, too! It would be great for any small objects, not just pencils! Zippers are easier then everyone thinks…I love them! Zippers don’t scare me. My mom taught me how to put in a zipper many years ago. My first zippered pouch was made from this tutorial. So easy and cute! Thanks. I am thinking of doing this on a larger scale to hold all my kids’ art projects. Adorable! I have 3 little girls in school. They would love to have a special pencil pouch that they designed themselves. Zippers scared me at first but once I started making bags they weren’t so bad, once in a while you get bad zipper instructions but you just figure them out. Love this tutorial – I used it to put in my first zipper, which turned out to be not nearly as scary as I thought it would be! 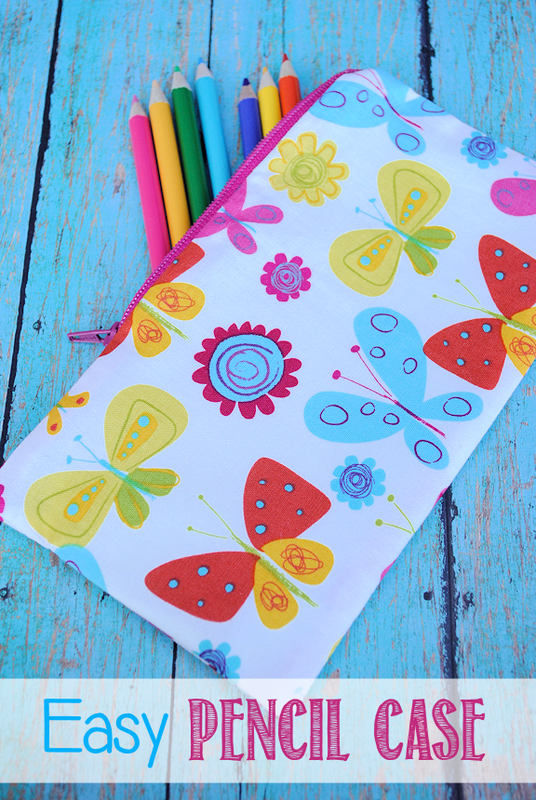 i love this pouch and the easy way to put the zipper on the fabric. These are so fun to make! I love how mine turned out. They actually do a little bit! Zippers do not scare me except for the invisible zipper application. I see a new pencil case for my son Jacob in his future. Yes they scare me, however after reading this post I am ready to tackle them!!!!! Zippers are super intimidating to me but I am hoping to conquer that fear soon! I’ve tried sewing a pencil case where the zipper is in the middle of the fabric, this seems much simpler! Super cute! Looks like an easy way to put in a zipper! Zippers did scare me until I read your zipper tutorial and now I wish I would have learner sooner. ABSOLUTELY DO….but loved your project last month which forced me to give it a try again….and found out it had been so frustrating all these years because I was not doing it properly….duh….so I did complete two pi tucked pouches with success. I’ll be making this for my son when he’s a little older. I don’t mind zippers although I have stuffed up the last few I have done… Practice makes perfect! I am a beginner and zippers do scare me! I’m not really scared of zippers. Zippers do scare me a bit, although zippered pouches do not. So easy! Yes, zippers scare me. But one of my goals this year is to sew and use a zipper. This looks the a great project to gain some confidence with. Will have to make this when my Laynie Bug starts school! Great project for my little guy who will be starting Kindergaten this year. No zippers do not scare me. I am a sewing teacher. Yes, I’m scared of zippers! Thank you for making zippers easier to understand. 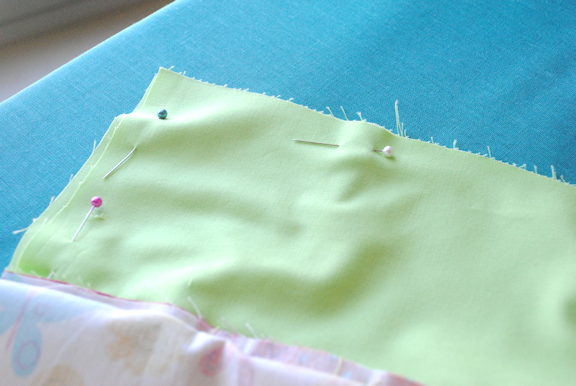 I’m not afraid of sewing them, but I do get stuck on how to put them all together sometimes…. Oh and the fabric is gorgeous! I make a lot of bags and sleepers so I do zippers all the time. Another winner! I love your quick and easy ideas! Zippers definitely scare me. I have to look up how to do one every time I sew one! Zippers scare me a little bit–I’ve made a few, but I do not have confidence with them… I always need to check how to layer them, etc. zippers are really quite easy for me. I haven’t done zippers yet (my grandma installs all the zippers on my projects lol). This seems like a simple enough zipper project to start out with. Can’t wait! I have yet to attempt working with zippers, but this looks like a great project to try. You make it all look so easy. Thank you for the inspiration. 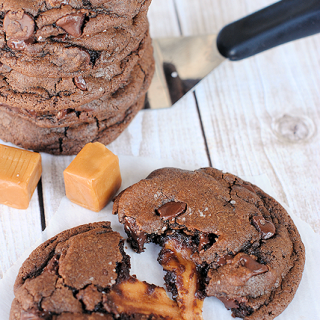 I need to make these for the kids! If I have good instructions they don’t scare me. I have installed many. would be an easy first project with zippers! They used to scare me, then I tried your tutorial ! Yippee! Ooh looks fun to make! Not at all! You have provided some awesome directions and short-cuts. Piece of cake! Yes…i am a beginner and zippers freak me out. Thanks to you and your learn to sew challenges I love zippers!! This would be a great way to teach my granddaughter how to sew zippers without being scared! Yes, but I’m improving. Every time it gets a teeny bit easier. Too cute. I’ve done many zippers in the past, so will be easy peasy. I’ve never braved a zipper- this makes it seem easy! we’ll see… lol! Haven’t needed to put in a zipper in a long time. About to get back to the clothes making (over summer) so I guess I’ll just have to cross my fingers and hope I remember how to do it. Seems pretty easy, I will have to try this! I have been wanting to make a zippered pouch to keep my envelope system, for my Dave Ramsey , in….this would be great! And I could make clothe envelopes to put inside it!! Love this, thanks…. a little bit right now they do because it’s been many years since I’ve sewn a zipper in anything!! A little bit of time and money and all my students could have the cutest pencil bags! Zippers do not scare me. Honestly? I have NEVER installed a zipper!! But no, they don’t scare me, just haven’t had the need yet. Zippers don’t scare me but I rarely make anything with a zipper in it! Zippers used to scare me, until I tried last months sew monthly challenge. Now I’ve made 3 things with a zipper (bean bag, tablet stand, and the pintuck pouch) and plan to make a large cosmetic bag with a zipper. I even ordered a few zippers so I have some on hand. I bought over 200 zippers at an auction for $5 so I could make a ton of these little pencil bags. I need more time in the day to sew all of these! I’ve been sewing since the dark ages so they don’t scare me at all. Zippers are intimidating lol. But like they say, practice makes perfect. I can’t wait to try this. Saturday when I can I will buy a zipper and try this. If I wanted to make this with vinyl fabric would a table cloth do? I have one with a flannel back and I think it would be great to try this on it. To cover the flannel would I sew the inside fabric at the same time as the zipper? And zippers scare me too. I am semi beginner. as I have sew a bunch of stuff I just never sewn a zipper cause it scares me. I’m not scared by zippers anymore! 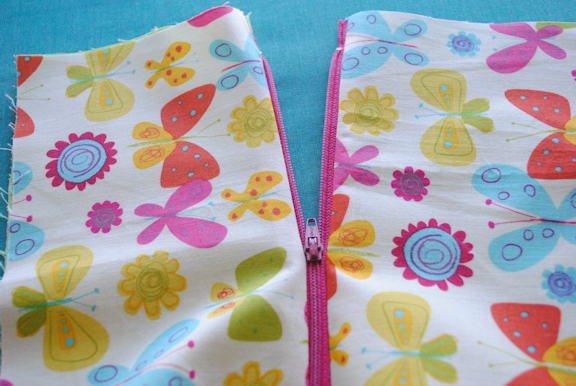 if I am sewing for someone else, then zippers scare me….for my own stuff…not so much! Yes, but has been a long while…not many zippers on quilt tops. Zippers scared me until I finally caved & tried them last week… They weren’t too bad. I’ve made this and soooo cute! I’ve always been a bit intimidated by zippers, but after me first few (and with an awesome zipper attachment) they are no longer a source of anxiety! Another one I’m tempted to try! Yes, I have not sewn one yet. Zippers can be scary things. You need to approach them with caution as they have a lot of teeth. Taping them down or (lamb-) basting them into place sometimes helps. Either way you need to not make any sudden moves and take it very slow. At first because I was worried I would break needles. Now I have broken lots of needles and my machine works. I do lots of zippers now! Pencil pouches for the whole class! Great tutorial. Can’t wait to make one of these! This looks so easy to sew and with five kids I will have a lot of fun letting the older ones pick out their own fabric. Thank you for the neat project! My daughters are always looking for their pencils. This hopefully will help them stay in one place. I’ve never sewn a zipper but they really don’t seem that hard. I am finding zippers are not that hard with the right tools and tutorials. How fun! I need practice with zippers. I needed this. I will be sewing on this weekend. I am pretty scared of zippers. I’m always afraid that I will mess them up! But I’m getting better. Yep. Zippers are the monsters under the bed for me! I just bought a handfull ot zippers on ebay. Im ready! no matter how many times I tackle a zipper, I always dread them! Zippers used to freak me out, until the January Sew Crazy challenge! Now–easy peasy! They don’t scare me, I just am not comfortable with my stitching looking as clean as I like. Um… YES! I have a hard time sewing basic, straight lines. HELLO, no I sewed garments for years and zippers are fairly easy for me now! I’ve been sewing for years and years! No fear of zippers! Zippers scare me, but I plan on tackling one in March. I’ve always been intimidated by zippers too, but this makes it looks do-able. Thanks! No, not really. I have made a few zipper pouches with no problem. They do scare my sewing machine though….it doesn’t like to sew over them very well. These are really cute to make for my kids to store colored pencils, crayons, and markers in to take to church. They do scare me, but that’s because I have never put one in a project before. I’m going to give it a try soon though! Wish me LUCK! Perfect excuse to finally get myself a sewing machine. I’m sick of my pens and pencils leaving marks in my handbags. Love this idea! Great way to use up scraps! Yes but only bc I’ve only done one and I butchered it…lol…I’m attempting another go of it this weekend…and using your tutorial this time. Love to sew these up as gifts ! I was so intimidated but zippers are really easy. I love how simple this tutorial is. I have bought the fabric and zippers. Now just need to do it! They look so cute. Zippers were my enemy until the sew easy pintuck zipper pouch!! Zippers scare me! I haven’t really had a bad experience with it but it just scares me! The pictures and tutorial are so easy to follow. Can’t wait to start sewing. Fun! As a new sewer, I might like to try a zipper pouch soon. Zippers don’t scare me until they get stuck and I stress that I’ll never be able to get whats inside! I need to practice zippers more. 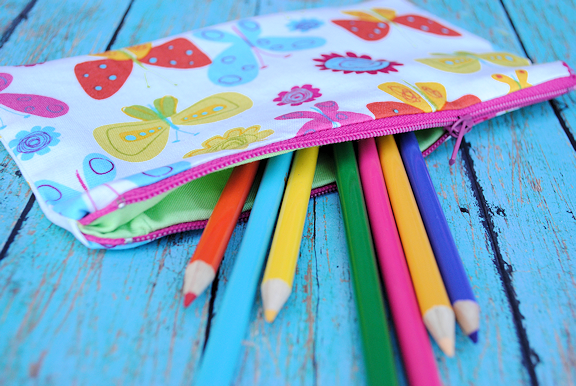 The pouch could be used for so much more than just pencils. Need to give it a try soon. My daughter will love this in school next year. I’ve never sewn in a zipper before. I’m a little intimidated, but you make it look easy! Thanks to 4-H, I did my first zipper at the age of 11. So I’ve never been afraid of zippers. Zippers scare me! I have tried a few and all I can say is…you win some, you lose some. This projects is cute and will be good practice for me. I haven’t done much with zippers but feel ready to tackle them! Thank you for the tutorial. Getting plenty of practise with zippers lately! Fabric looks lovely. So great! Then the kiddos can have a unique pencil bag. You should have seen my first zipper experience when I was a kid learning to sew but I’m not afraid of them now. They used to scare me until I did the January zipper pouch challenge. I’m really awful at zippers but this will help out so much!! thanks! Well I made it to clue number 2. Zippers don’t scare me…yet…I haven’t tried to do one yet! They don’t scare me but I don’t enjoy working with them! Zippers scare me a little – I like to use instructions instead of trying it on my own. 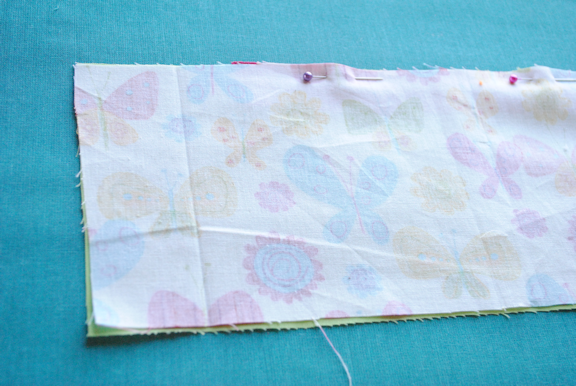 Hmm this looks doable…I may try zippers for the first time! Such a cute idea! I love the Pepe in Paris prints, too! Yes, they do scare me. I’ve yet to do one. Though I did buy it, so one step at a time. And yes, zippers scare me! It’s been over 20 years since I’ve attempted sewing one onto something! zippers totally scare me – but I finally bought one so I can at least try! Not a fan of zippers but I have used them at times. Thanks for the giveaway. Yes, they do! But I need to get over it. Zippers do not scare me. I’ve been sewing them in projects for years. I love pouches! Great tutorial. Yep. That’s what I did. I just found your blog and I am loving it!!!! The back pack tut…I was about to buy a pattern, not now, and this one :) I’m sewing the backpack for my 4 yo whose starting pre-k and big bro going into 3rd is wanting one too…I dont think thats the best idea so Im looking for other little things…he needs a zipper pouch to fit his binder…I am going to attempt to add the rings to one for him…I will use canvas and interfacing to make it sturdier as well, but they are asking for a fabric one, so he’s gonna get one!!! Thanks so much!!! I am making this now, and I found that with a 9″ zipper, the 9″ indicates the opening of the zip hole. 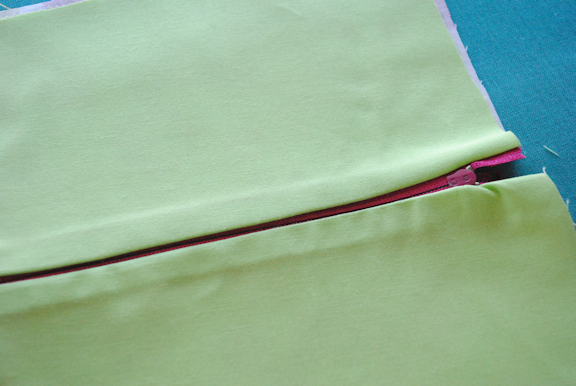 So when cutting your fabric, don’t measure and cut it “9×5″ cut it to THE LENGTH OF THE ENTIRE ZIPPER. You will need the extra on both sides. The zipper I’m using measures about 10 1/4” from end to end, so cut to that length. Maybe this is common knowledge, too bad I don’t have any of that!! Thank you for mentioning this! I wish I’d read your comment before starting this project. I’m new to sewing and made one of these pouches today, but I followed the cutting instructions exactly. It was difficult to sew over the ends of the zipper because the edges of the fabric lined up with the stopping points of the zipper – metal pieces which are, um, challenging for a machine to sew through/over. It also would have been helpful to have a photo of the whole project laid out just before sewing around it, as it would have shown me which way to fold the sides of the zipper (toward the lining or toward the exterior?). Despite the challenges, this was a fun project and mine turned out quite cute, so I will be doing it again with my daughter (with the fabric size adjustment). these are so cute and easy to make. they are going to make great christmas presents. thanks for sharing! Thank you for sharing your beautiful and clear tutorial. I am a self taught sewer, and often do not measure, nor do I use patterns. I like the learning that comes with trial and error. But, sewing in a zipper proved more confusing than I imagined. So, I bought myself a few zippers (14″) and actually decided on a project, a water resistant ipad mini sleeve. I cut up one of those recyclable grocery bags for the lining, and cut up the top of 100% fleece pajamas. I got a new pair for $9.99 online this winter, and I never use the tops (I don’t like the buttons), so I save them for scrap projects. It worked out PERFECTLY!!!! Thanks again.